The 2012 Senior National Championships were held in Dallas, Texas on April 21-22, 2012. Athletes from around the country competed, all vying for national titles in their respective weight divisions. 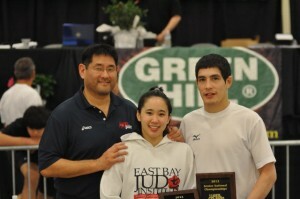 Representing EBJI were Annie Shiraishi and honorary member Mike Eldred. Mike, who trains regularly out of the Western Idaho Judo Institute in Fruitland, Idaho competed on the first day of competition in the men’s 73 kg division. Mike cruised to the final defeating Alex Jacobson, Steve Perez, and Adam Moyerman all by ippon. In the finals, he faced Salama Salem from Tech Judo whom he pinned for ippon to win his fourth consecutive national title. Mike, who is ranked in the top 25 in the world, will compete against Nick Delpopolo on May 12th at the Olympic Trials in Miami, Florida. Annie Shiraishi moved up from her normal 48 kg weight class to compete in the women’s 52 kg division. After a first round bye, she faced 52 kg #1 seed Angelica Delgado from Florida. Annie dominated the match, giving Delgado a couple of penalties before throwing her for wazari. She advanced to the semi-finals and faced Cammi Kaichi from the Jason Morris Judo Club whom she also dominated by throwing for two wazaris. In the finals, Annie faced Natalie Lafon, whom she had competed many times against, including at the 2008 Olympic Trials in Las Vegas. Annie dominated the match from early on, giving Lafon two stalling penalties to hold on to the win and her second national title at 52 kg (adding to her title in 2008). For their efforts, Mike won the Most Outstanding Male Competitor award of the tournament and Annie won the Most Outstanding Female Competitor award. Both Annie and Mike were coached by David Matsumoto Sensei, who has been coaching at the Senior Nationals for several decades. This was Matsumoto Sensei’s last time coaching at the Senior Nationals, and he was extremely proud of his competitors and how they fought. Annie now turns her attention to the 2012 Pan American Championships in Montreal, Canada where she competes this weekend. This tournament is the last qualifying tournament for the 2012 London Olympic Games. Mike now turns his attention to the Olympic Trials, to be held on May 12 in Miami, Florida. He will compete against fellow American Nick Delpopolo to become the US representative in the men’s 73 kg division.